Cherished and loved by sushi connoisseurs, Bluefin tuna (“hon-maguro”) is a pillar of Japanese traditional cuisine. In fact, the Japanese consume 80% of the world’s Bluefin tuna. Unfortunately, these giants of the sea are becoming increasingly scarce; the species was recently listed as “Vulnerable” to extinction on the IUCN Red List. 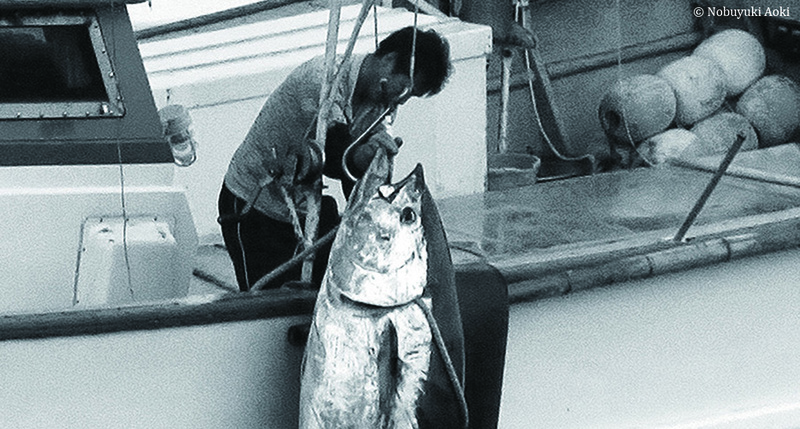 Commercial Bluefin tuna fishermen in Japan, whose livelihoods depend on these fish, know well the fishery is in decline but are not always in the position to take action. However, one fishery, the Iki Island pole and line fishery, has taken unique measures to halt the decline of their resource. Starting this year the fishery has voluntarily banned fishing for spawning adults, at great sacrifice and expense to their (short term) business interests. The following lament was read aloud by one of the Iki Island commercial fishermen during an official hearing by the Japanese Fishery Agency on the situation of Bluefin tuna in Japan. A blessing from the sea! I am filled with gladness! Before the tuna can reproduce? What can we do as fishermen?